For the town of Columbia, see Columbia, New York. Columbia County is a county located in the U.S. state of New York. As of the 2010 census, the population was 63,096. The county seat is Hudson. The name comes from the Latin feminine form of the name of Christopher Columbus, which was at the time of the formation of the county a popular proposal for the name of the United States of America. 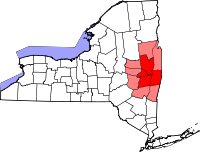 Columbia County comprises the Hudson, NY Micropolitan Statistical Area, which is also included in the Albany-Schenectady, NY Combined Statistical Area. It is located on the east side of the Hudson River. At the time of European encounter, the area was occupied by the indigenous Mohican Indians. To the west of the river were the Mohawk and other four tribes of the Iroquois Confederacy, extending past what is now the border of New York state. The first known European exploration of Columbia County was in 1609, when Henry Hudson, an English explorer sailing for the Dutch, ventured up the Hudson River. An accident to his craft forced him to stop at what is now known as Columbia County, and search for food and supplies. In 1612, the Dutch established trading posts and minor settlements, constructing New Amsterdam (today New York City) and Fort Orange (today Albany). Fort Orange became a center of the fur trade with the Mohawk people. Traders began to stop at midway points along the Hudson River, on their travels between New Amsterdam and Fort Orange. Small settlements arose along the river to supply the traders' ships. In 1649, Dutch colonists purchased land near Claverack and in 1667, more land was purchased. As more Dutch arrived, the region slowly developed. In 1664, the English took over New Netherland and renamed it the Province of New York; they also renamed Fort Orange as Albany. In the late 17th century, Robert Livingston, a Scots immigrant by way of Rotterdam, built on his connections as Indian agent in the colony and purchased two large portions of land from the Native Americans. He gained much larger grants from the provincial government, for a total of 160,240 acres. He was made lord of the manor by the Crown, with all its perquisites, and started to develop the property with tenant farmers. In 1710, he sold 6,000 acres of his property to Queen Anne of England for use as work camps and resettlement of Palatine German refugees. The Crown had supported their passage to New York, and they were to pay off the costs as indentured labor. Some 1200 Palatine Germans were brought to Livingston Manor (now known as Germantown). New York's Governor Hunter had also helped with these arrangements: the workers were to manufacture naval stores (e.g., pitch, resin, and turpentine) from the pine trees in the Catskill Mountains. Columbia County was formed in 1786 after the American Revolutionary War from portions of Albany County, once a vast area until new communities were developed and jurisdictions were organized. In 1799, the southern boundary of Columbia County was moved southward to include that portion of Livingston Manor located in Dutchess County. In the nineteenth century, the Vermont Central Railway was constructed to the area. It provided transportation north towards Rutland and Burlington, Vermont, and south towards the major junction town of Chatham, New York, for travel to points west, south and east. Organizations such as "Vote Columbia" have led efforts to have New York City residents, who live in a heavily Democratic Party-controlled area, re-register to vote in their part-time residence of Columbia County, thus influencing the demographic of a lightly populated area that is home to an increasing number of people in weekend houses or retirement. Local residents have expressed dismay that voters who stay in the county only on the weekends are influencing its politics and decisions over development, schools and other issues. The rise in the number of Democrats has resulted in a virtual tie among the number of Democrats, Republicans and non-affiliated voters in Columbia County. [citation needed] In the 2007 election cycle, Democrats came within two seats of taking control of the county Board of Supervisors. In the 2009 local elections, the Republicans increased their majority on the Board of Supervisors through the defeat of longtime Kinderhook Supervisor Doug McGivney. As Supervisor of the largest Town in the County, McGivney had the largest weighted vote on the Board of Supervisors. [citation needed] The Board of Supervisors is now led by Supervisor Pat Grattan (R-Kinderhook). According to the U.S. Census Bureau, the county has a total area of 648 square miles (1,680 km2), of which 635 square miles (1,640 km2) is land and 14 square miles (36 km2) (2.1%) is water. Columbia County is in the southeast central part of New York State, southeast of Albany and immediately west of the Massachusetts border. The western border is the Hudson River. The terrain is gentle, rolling hills, rising sharply into the Taconic and Berkshire Mountains along the state line. Columbia County is accessible by two limited-access highways. The Taconic State Parkway, which is not accessible to trucks or commercial traffic, runs through the center of the county from south to north, ending at an interchange with Interstate 90 and connecting the county with points south. Columbia County is the last New York county located along eastbound Interstate 90 (and the first county along westbound I-90), which passes through the towns of Canaan and Chatham as the Berkshire Connector portion of the New York Thruway. I-90 has two exits within the county; for the southbound Taconic State Parkway in Chatham, and for NYS Route 22 in Canaan. Depending on precise location within the county, road travel distance to New York City ranges between 96 miles (154 km) and 145 miles (233 km). Several other major routes cross Columbia County including north-south U.S. Route 9, east-west NYS Route 23, north-south NYS Route 22 and a short portion of east-west U.S. Route 20 in the county's northeastern corner. The Hudson River forms the western border of the county. Other notable creeks include; the Ancram Creek, Claverack Creek, Copake Creek, Kinderhook Creek, Roeliff-Jansen Kill, and Valatie Kill. The Rossman Falls and Stuyvesant Falls lie on the Kinderhook Creek. Notable lakes and ponds include Copake Lake, Kinderhook Reservoir, Queechy Lake, and Lake Taghkanic. Columbia County is home to many local farms supplying the area with fresh meat, eggs, herbs, and produce, including Letterbox Farm Collective, Blue Star Farm, Green Mead Farm, Little Ghent Farm and Ironwood Farm. Other farms include the large, well-known Hawthorne Valley Farm which includes a farm store and training programs, the biodynamic Roxbury Farm, and FarmOn! at Empire Farm, also a teaching farm. As of the census of 2000, there were 63,094 people, 24,796 households, and 16,588 families residing in the county. The population density was 99 people per square mile (38/km²). There were 30,207 housing units at an average density of 48 per square mile (18/km²). The racial makeup of the county was 92.09% White, 4.52% Black or African American, 0.21% Native American, 0.80% Asian, 0.03% Pacific Islander, 0.90% from other races, and 1.45% from two or more races. 2.53% of the population were Hispanic or Latino of any race. 17.2% were of German, 14.7% Italian, 14.5% Irish, 9.0% English, 6.3% Polish and 6.1% American ancestry according to Census 2000. 94.0% spoke English and 2.1% Spanish as their first language. There were 24,796 households out of which 29.90% had children under the age of 18 living with them, 52.20% were married couples living together, 10.30% had a female householder with no husband present, and 33.10% were non-families. 27.10% of all households were made up of individuals and 11.50% had someone living alone who was 65 years of age or older. The average household size was 2.43 and the average family size was 2.95. In the county, the population was spread out with 24.10% under the age of 18, 6.40% from 18 to 24, 26.90% from 25 to 44, 26.30% from 45 to 64, and 16.40% who were 65 years of age or older. The median age was 40 years. For every 100 females there were 99.00 males. For every 100 females age 18 and over, there were 95.30 males. The median income for a household in the county was $41,915, and the median income for a family was $49,357. Males had a median income of $34,702 versus $25,878 for females. The per capita income for the county was $22,265. About 6.40% of families and 9.00% of the population were below the poverty line, including 11.80% of those under age 18 and 6.80% of those age 65 or over. Columbia–Greene Community College is located in Hudson, NY. Interstate 90 runs east-west through the county. The Taconic State Parkway runs from I-90 south towards Westchester County. The main arterial north-south road, U.S. 9, runs through the larger towns towards the Hudson River. Amtrak passenger trains of the Empire Service corridor make stops in Hudson. Until 1960s the Penn Central railroad's local service between Albany, NY and Boston, made stops in Chatham. Both the Penn Central's New England States (discontinued, 1967) and Amtrak's Boston-bound section of the Lake Shore Limited, making the same route, have not made stops in Columbia county. Until 1953 the Rutland Railroad (in map above) operated trains to Chatham, which continued over New York Central's Harlem Line to Grand Central. Penn Central (successor to the New York Central) truncated service on the Harlem Line to Chatham in 1972. Columbia County Airport is located in Hudson and provides general aviation services. ^ a b Columbia County, NY.com. "History of Columbia County, New York". Retrieved 2008-02-11. ^ a b c Rootsweb. "History of Columbia County". Retrieved 2008-02-11. ^ a b c Knittle, Walter Allen (1965). Early Eighteenth Century Palatine Emigration. Baltimore: Genealogical Publishing Co. ISBN 0-8063-0205-4. ^ "Columbia County Home to Next Generation of Farmers". TWC News. Retrieved 2015-10-14. Wikimedia Commons has media related to Columbia County, New York.